When you purchase any piece of equipment, it is with the hope that it will last for a long time. Luckily, Eagle Iron Works designs and manufactures their equipment with longevity in mind, offering heavy-duty designs that are built to last. Powering these rugged machines are Eagle Iron Works’ own heavy-duty gear reducers, which feature heat-treated helical gears, triple reduction gearing and maintenance-free operation. Eagle gear reducers are known to provide long-lasting service in the field and have been proven time and time again. These gear reducers are so reliable, they’ve even outlasted the deposits at some sites! Although Eagle machines are designed to provide a long service, getting your equipment to last more than half a century requires some care on your part. One of the best ways to care for your machine is to conduct routine maintenance checks. These can help you catch any potential issues before they happen or before they turn into something devastating, which can turn into costly downtime. Besides conducting routine maintenance checks, here are some ways to keep your Fine Material Washer running for a long time. Properly installing your Fine Material Washer will ensure it operates at optimum efficiency. Operating your Fine Material Washer before verifying it has been installed correctly can cause unnecessary wear on the machine and lead to breakdowns. Check the tub slope. It should be 18° or 7’ 9’’ for a 24-foot run. Check the oil level in the gear reducer. This should be done with the machine in operating position at the 18° slope. Check the tension of the V-belt drive. Check the inside bottom of the Fine Material Washer for unnecessary material that may interfere with the conveyor shaft rotation. Check the rotation of the conveyor shaft. The shaft should rotate up on the side with the curved bottom plate. Check that the weirs are level by filling the Fine Material Washer with water to the point of overflow. Adjust as needed. Check the backflush water in the backflush channel (drainboard). The backflush channel should be clear of product to the water line while the machine is in operation. Check for leaks where the side flares bolt to the Fine Material Washer. If leaks are present, caulk the inside of the tub as necessary to stop the water from escaping. * Single screw washers use right hand parts. Recommended spare parts may vary for different size screw washers. For the full list of spare parts, refer to the Installation, Operation and Maintenance Manual that came with your Fine Material Washer. If you notice issues like material buildup, loss of fines, loss of bearing pressure or excessive bearing wear, the following tips can help you determine the cause and solution. Your screw speed may be too fast. Run a screen analysis of the feed and contact your distributor or manufacturer for recommended screw speeds. The buildup may be caused by inadequate silt dilution. If overflow from the washer contains good sand, increase the water to the curve plate or decrease feed tonnage. The Fine Material Washer may be overloaded. Check for sand just spilling over the top of the conveyor shaft on the third section of the exposed screw above the water line. To check if you are losing fines from your Fine Material Washer, hold a 100 mesh screen under the overflow for 20-30 seconds, then remove the screen from the flow. If no material is present on the screen, you are not losing fines. If material is present on the screen, it may indicate the loss of fine material over the back of the screw. The loss may be from supplying too little fresh water to the screw washer. Determine the volume of water overflowing the weirs by leveling the weirs and comparing the overflow depth to the chart below. You can use this table to estimate the total gallons per minute of water actually flowing for any given washer. 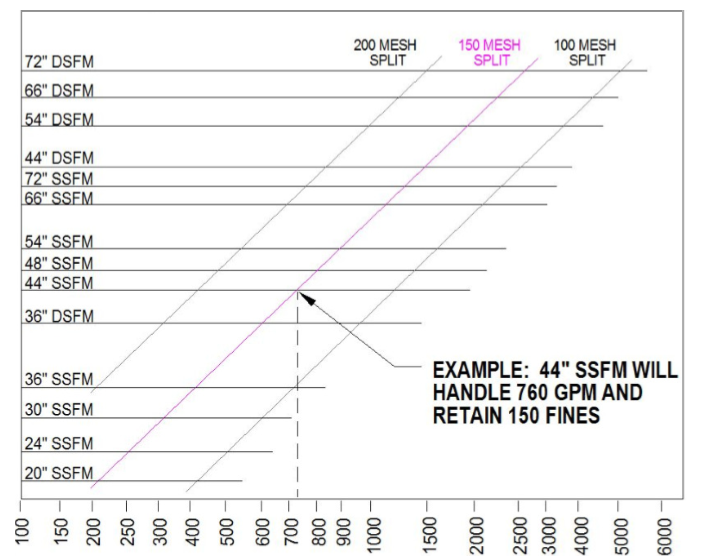 This chart shows the relationship between the amount of water supplied and the mesh of material retained for the various washers. It shows the amount of slurry at low silt content that a Fine Material Washer will overflow and retain at various mesh sizes. To determine the amount of water (in gallons) needed to make your desired hydraulic split, select your machine size from the vertical column on the left and follow the horizontal line below to the diagonal line that corresponds with the desired mesh size of the retained product. Where the horizontal and diagonal lines meet, draw a vertical line down to the bottom of the chart to determine the water capacity in gallons per minute. The loss of fines may be caused by inadequate silt dilution (too low ratio of clean water to the amount of total silt). If you have a hydrometer, you can use it to check the possibility of this condition. A specific gravity reading of 1.200 or higher indicates this possibility. For proper silt dilution, shoot for a minimum of 50 gpm/tph of silt coming to the washer. Verify the backflush water is flowing sufficiently to keep the backflush channel clear of material. The backflush channel should be free-flowing all the way down to the water pool. Too high of feed will cause sand to build up in the backflush channel. This will make the end product wetter. If everything is working well and you are making a concrete sand, then your target percent solids is 80%. Loss of pressure to the Hydrotex bearing is usually caused by a loss of line pressure. Loss of pressure from the Hydrotex bearing is usually caused by excessive wear on either the Hydrotex bearing, the wear sleeve, the bearing protector or a combination of all three. To inspect the Hydrotex bearing, remove the cover from the bearing. If either the bearing or the wear sleeve shows 1/8” wear, the items showing this wear should be replaced. Next, check the bearing protector for position and wear. The gap between the bearing protector and the bearing housing should not exceed 1/8”. The Hydrotex bearing requires 25 psi and 25 gpm of clean water for proper operation. If you would hesitate to drink the water, then don’t run it through a Hydrotex bearing. Water contaminated with clay, silt or other particles can cause wear to and damage the Hydrotext bearing. Check the bearing water to see that it is clean. If clean water is not available, consider converting the washer to a new grease lubricated outboard bearing. Check the radial runout on the bearing stub shaft at the flange. This runout should not exceed 0.010”. Inspect the check valve in the water line to the bearing to ensure it is operating properly. The startup and shutdown procedure should also be checked to ensure that the bearing has water at all times that the screw is rotating. Excessive Hydrotex bearing wear could be caused by improper bearing installation. The water groove on the bearing should be at the side of the shaft where the outer edge travels downward. The bearing should be secured in the proper position with a set screw. Getting your Fine Material Washer to last more than 50 years isn’t impossible. Eagle Iron Works Fine Material Washers are already built to last for decades, but proper care and maintenance can ensure they will remain producing for a long time. Don’t miss a future post about Eagle Iron Works! Subscribe to learn what Eagle Iron Works equipment can do for you!